This painting was commissioned to be done by Captain Robert Horton Esq. in 1866 to commemorate the wonderful escape from shipwreck of his daughter. This painting was commissioned to be done by Captain Robert Horton Esq. in 1866 to commemorate the wonderful escape from shipwreck of his third daughter, Gertrude, wife of Captain Herbert Ellis Danvers, and of the great mercy and goodness of Almighty God in preserving her life, as well as her husband and infant, through the awful night of 27th April 1864. Captain Danvers of the Barquentine "The Countess of Seafield" a 1000 ton vessel, left England with my daughter (his wife) and infant in the afternoon of a Sunday in February 1864, bound for Port Lyttelton, New Zealand. On the night of the 27th April, they experienced a violent hurricane in the South Pacific - Lat 47' 12' South, Long. 78 East, Wind S.W. On the morning of the 28th the Barque was swept by a huge wave which carried away the house on deck, boats, bulwarks, stanchions, and mainsail. Nine able bodied seamen, one officer, one passenger, were all swept away and lost. The cries of the drowning seamen for help are described as being of the most piteous nature. The whole of the sails (all new) were blown to ribbons. The Captain was all alone on deck after the men had been swept away. He crawled on his hands and knees while the vessel was pounded and swept by a raging gale and terrific seas (see painting) to the chain. The tackle of the rudder having given away and the wheel washed overboard. By seamanship and superhuman strength, which at the time could only have been given from "Above" and nearly tearing his shoulders from their sockets, he managed to pull the ship round, and by the assistance of another man saved the ship from a downward plunge. 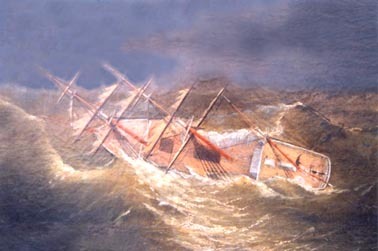 Captain Danvers was all alone on deck after the men had been swept away. "... had such another sea struck them, they would all have been lost." The ship was manned with only four hands for five weeks when they sighted Hobart Town where they put in for repairs. Read a detailed account of the disastrous events which featured in the Lyttelton Times in 1864. Read also the history of the barque Countess of Seafield an article by the late Jack Loney. The painting is presently owned by Michael Johnson, great grandson of Herbert Danvers.